U bevindt zich op een Atradius website. Door te klikken op welke functionaliteit dan ook in deze website, gaat u ermee akkoord dat u ons uitdrukkelijk en automatisch toestemming geeft cookies te gebruiken om informatie over u op te slaan, met inbegrip van de eerste cookie die werd aangemaakt toen u deze website opende. Wilt u meer weten over het gebruik van cookies en hoe u deze kunt uitschakelen? Ga dan naar onze cookiespagina. Crucial reforms have been passed, but their proper implementation remains to be seen. Mexico’s economy is highly dependent on oil (accounting for more than 30% of government revenues) and closely linked to the US business cycle, which accounts for 80% of Mexican exports. Since 1994, GDP growth has been structurally low at an average annual rate of 2.6%, due to low investment and weak productivity. Since the second half of 2014, Mexico´s economic performance has been hampered by a more volatile global economic environment and domestic political woes. Since fall 2014, concerns over the security situation have grown, following the disappearance of 43 students in the city of Iguala. These were presumably kidnapped and killed by police forces in league with a regional drug cartel. Public discontent about the way president Peña Nieto handled the situation resulted in country-wide protests and falling approval ratings. Since then, several other crime-related incidents and corruption scandals have weighed negatively on business and consumer confidence, affecting domestic demand. 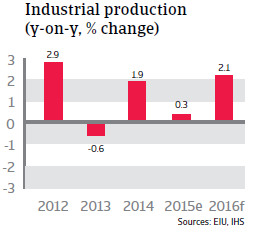 Industrial production remains subdued, and is expected to grow only 0.3% in 2015. 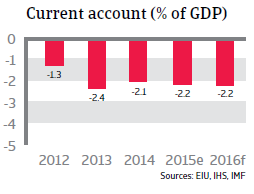 This, combined with fiscal consolidation measures aimed at the negative impact of lower oil prices on government finances, has resulted in sluggish real GDP in H1 of 2015. That said, real exports have picked up again since the beginning of 2015, as Mexico benefits from the robust performance of the US economy. 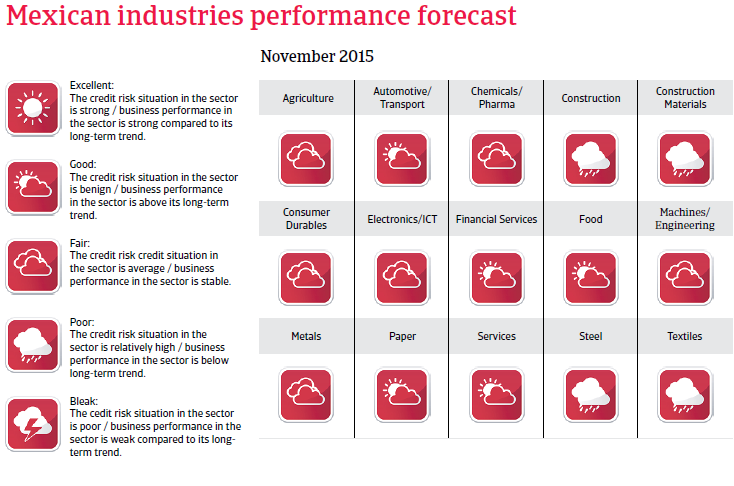 Domestic demand is expected to increase as inflation decreases. 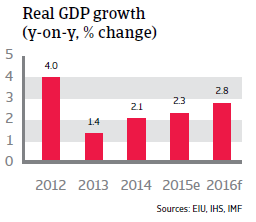 In 2016, economic growth is forecast to reach 2.8% after a growth of 2.3% in 2015. 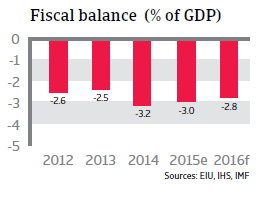 Overall, Mexico’s budgetary policy has been solid, with acceptable public sector finances (government debt of 50% of GDP and a budget deficit of 3.0% of GDP in 2015). There have been improvements in the fiscal framework and higher tax revenues, following a tax reform passed in 2013. However, fiscal flexibility is still constrained by low tax revenues (Mexico has a narrow tax base of only 10%) and the structural decrease in oil revenues. With oil accounting for about a third of government revenues, decreased oil prices are putting pressure on government finances and complicating the implementation of energy reforms. Nevertheless, oil price hedges limit the effect of the recent decline in oil prices on government finances. At the same time, budget cuts have been implemented and the bidding process for exploration and exploitation of oil fields by private companies has been kept on track. Public debt is expected to peak at 52% of GDP in 2016. The Bank of Mexico has kept the benchmark interest rate at a record low of 3% since June 2014 in order to boost economic growth, while inflation remains below its target range of 2%-4% (a 2.7% increase in consumer prices is forecast for 2015). That said, the concern remains that an increase of US interest rates by the Federal Reserve could spur foreign investors to withdraw capital, leading the Bank of Mexico to follow suit. In general, Mexico’s banks are well capitalised and liquid, with limited exposure to foreign currency risks. However, they are performing below potential (bank assets as a percentage of GDP stand at just 45%), constraining the credit growth needed to stimulate more private consumption. A cautious lending policy is also restricting financing options for small and medium-sized enterprises. Since 2013 the Peña Nieto administration and the Mexican Congress have passed some comprehensive reforms to overcome the economy´s structural weaknesses: low earnings capacity, limited fiscal flexibility and high dependency on volatile portfolio capital inflows. In the past, reform efforts have often failed because of a lack of political will or insufficient support from opposition parties in Congress, in effect, impeding economic efficiency and longer-term GDP growth. Despite some public protests, an education reform bill was passed in early 2013. This was followed by bills to liberalise the telecommunications market, to reform the tax system to broaden the narrow tax base, and to open the monopolised electricity market. However, with oil production decreasing over the last 10 years and the government´s high dependence on oil revenues, the centrepiece of the reform efforts is the reorganisation of the energy sector. Pemex, the state-owned oil and gas company, lacks the know-how and financial resources to invest in exploration and production, mainly because it pays 90% of its revenues to the state. Pemex therefore urgently needed permission to cooperate with private (foreign) investors for joint exploration, refining and distribution. Finally, the constitutional changes implemented at the end of 2014 have put an end to Pemex’s 75-year monopoly and enabled foreign companies to invest in the exploitation of offshore oil fields and shale gas. Although the first auction of shallow water oil fields held in July 2015 failed, the government proved to be a quick learner as it adjusted contract terms to make fields more investors-friendly, thereby showing its continued commitment to these important reforms. A second auction held in September 2015 went much better, with three of the five fields being sold. One of them was purchased by Eni of Italy, which was a welcome sign of faith from one of the world’s energy majors. These fields are expected to generate a peak of 90,000 barrels per day of light and medium crude oil by 2022 and to reverse the downward trend in oil production by 2018. A comprehensive and swift implementation of the reforms would increase investment and significantly improve the economy´s productivity and competitiveness, raising Mexico´s potential annual GDP growth rate from 3.0%-3.5% to 4%-5% in the long term. Lower energy and electricity costs should increase the productivity and profitability of Mexican industries, especially export driven ones such as the automotive industry. Moreover, it would boost foreign direct investment and reduce dependency on volatile portfolio capital inflows. However, proper implementation is key (e.g. transparent bidding processes). It remains to be seen to what degree the big state-owned electricity and energy businesses are willing to accept competition and end their monopolies. Public protests and political struggles between the main parties could still derail proper implementation. More needs to be done to tackle the poor domestic security linked to drug-related violence and rampant corruption, both of which severely affect the business climate and hamper economic performance by discouraging investors. At the same time, the profitability of many businesses has suffered from threats and violence against business owners, including the kidnapping of their family members. For a solid recovery of the country’s medium-term earnings capacity, Mexico would need to improve its law enforcement, the independence of the judiciary system and to overhaul police institutions. In this respect, the approval of a comprehensive anti-corruption law by the Mexican Congress is another step in the right direction. In general, Mexico´s economy is well positioned to deal with the current challenges stemming from decreased oil prices, a stronger USD and the expected increase in US interest rates (potentially leading to higher exchange rate volatility). Its resilience is underpinned by prudent macroeconomic policies, a flexible exchange rate and solid external balances, with limited current account deficits and external refinancing needs. Depreciation of the Mexican peso against the USD could pose a challenge for businesses that have increased their USD borrowing over the past years. That said, corporate debt is still low, at 21% of GDP. 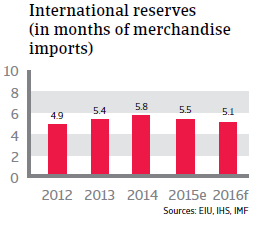 About two-thirds of this debt is being externally financed, and refinancing risks are being mitigated by sufficient foreign exchange reserves to cover imports for more than five months. There is additional liquidity potential from a precautionary IMF credit line of USD 70 billion on which Mexico can draw in times of adverse global credit conditions. 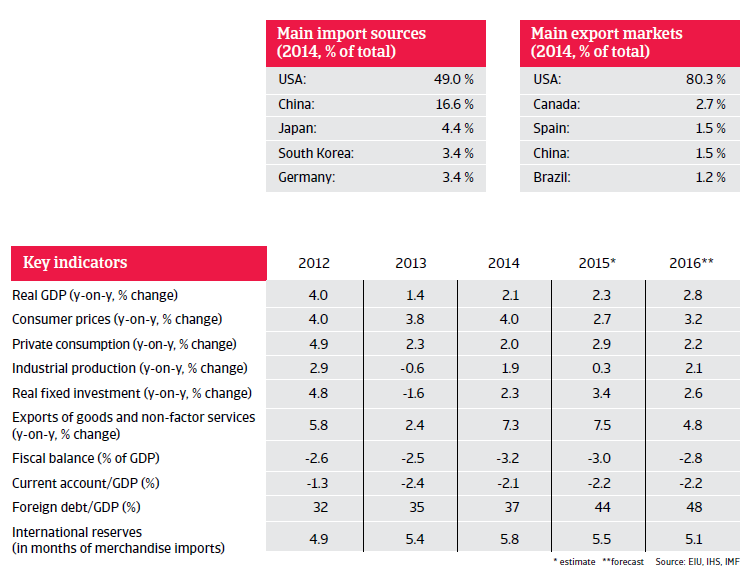 Solvency is also robust: foreign debt ratios are under control (44% of GDP, 110% of exports). Mexico’s steel industry is expected to continue its rebound in 2015, thanks to an upturn in construction activities: mainly through housing and infrastructure investment postponed in 2013. One in three businesses surveyed in Brazil, Canada, Mexico and the United States reported that around one-fifth of the value of their B2B receivables is more than 90 days overdue.